Autocuehire is one of the UK’s leading Autocue and Teleprompter hire companies for Conferences and Roadshows. Our experienced and professional operators have many years experience working on conference and roadshows of all shapes and sizes. Our equipment is top of the line so you know you’re in the safest of hands. At Autocuehire we offer a complete Autocue and teleprompter hire service for conferences and roadshows, We understand that every event is different, whether you’re in conference with your industry peers or unveiling a new car to the world. We will discuss all of your requirements and create a solution that is suited uniquely to you. Our solutions are 100% bespoke to your needs, and are priced competitively. We offer the very latest in autocue and teleprompter technology. Our Operators are highly experienced in a huge variety of events. The software we use is a best in class, robust application, which imports word documents easily, and we can edit the script via the application. The software also supports all Unicode based languages. 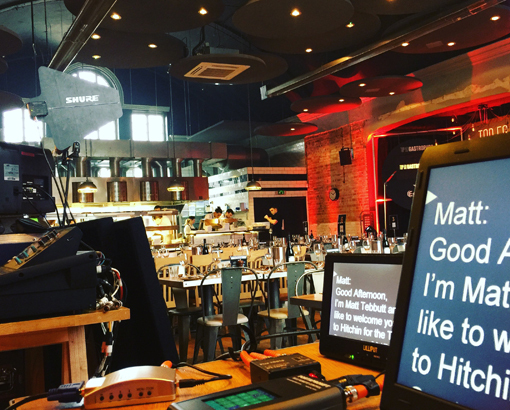 Autocuehire have an autocue and teleprompting solution for you. Our systems can add huge value to your event, whether you have one or a whole host of speakers, our autocue and teleprompter systems ensure they say what they need to, without having to remember pages of script. By using one of our bespoke solutions your speaker will be able to concentrate on delivering an engaging performance without fumbling around with paper, forgetting their lines, or missing a stage direction all whilst maintaining an eye line with your audience. From the perspective of the audience the teleprompter glass looks transparent, whilst the presenter can clearly see their speech displayed in front of them., creating the illusion that the presenter is eloquently delivering a speech without aid. Autocuehire are based in the west of London where we are ideally situated to travel wherever we are needed. We are more than happy to jump on a plane to get to you. Wherever you’re holding your conference or roadshow, we can be there.